New Vinyl Anachronist is online! 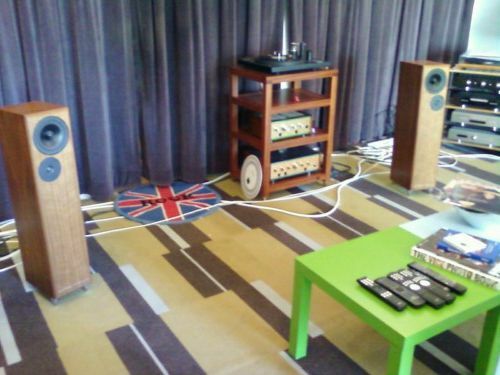 My latest Vinyl Anachronist column--the 75th!--is up at Perfect Sound Forever: http://furious.com/perfect/vinyl75.html. This features my interview with Brian Di Frank, owner of Whetstone Audio here in Austin, Texas. Hope you enjoy it! I'm also working with two more DJs--Tim Williams and Ruler Why--for future installments. Tim has been a DJ for over 20 years and owns a record store, and Ruler is the producer for the hip-hop collective The Vultures. You gotta love donkeys. Well, I guess you really don't, since I know a woman who has a deathly fear of them (their hee-haws scare the crap outta her, and she was bitten by one as a child). 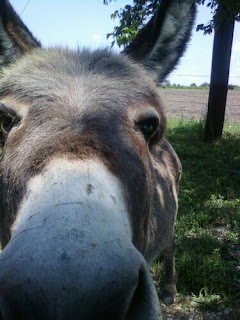 But everytime I meet a donkey, it's sweet-natured, friendly and absolutely beautiful. I met the one above while visiting a friend earlier today. He walked right up to my car, stuck his nose inside and let me pet him. I think he wanted a carrot or some other type of donkey treat, but he still let me pet him for a good minute or two. Then he started to follow me as I headed down the road. I had to back up and wait for his owner to grab him and lead him back to his yard. I could just imagine letting him follow me all the way home and then asking everyone, "Can I keep him?"